AppVeyor is a cloud-based continuous integration system that integrates natively with your source control and allows CI configuration files to live alongside your projects. 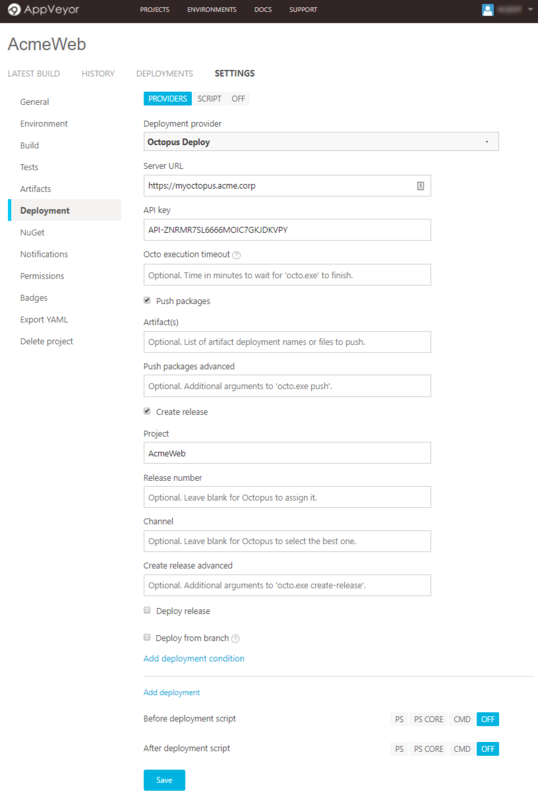 This page will guide you through leveraging AppVeyor's build chain with Octopus Deploy's deployment capabilities. Create a new AppVeyor project and use the Git repository https://github.com/OctopusSamples/RandomQuotes-aspmvc4 as the source. Go to the Build page and add nuget restore to the Before build script command line input since AppVeyor will not perform this operation by default. Under Automatic Packaging select Package Web Applications for Octopus Deployment. By ticking this box AppVeyor will run octo.exe pack after MSBuild has finished its publish command. _Keep in mind that since AppVeyor is doing a publish, some of the files that would usually be included by the OctoPack MSBuild target might not be included by default (this includes the various web. *.config files). To ensure these files are included in the package make sure they are configured to Copy to Output Directory is Visual Studio. AppVeyor have included octo.exe into the base Windows build VM and is available via the command line. If running a project not using msbuild you can manually invoke the octo.exe pack command directly during the build phase. If using this mechanism, you also need to flag the generated archive with AppVeyor that this file should be treated as an artifact of the build to be made available for subsequent steps. This can be done via the Artifacts page. You can simply provide a wildcard to pick up the dynamically generated package. With the build page configured, go to Deployment and select the new Octopus Deploy Deployment Provider. This provider will perform all the appropriate calls to push the package to the Octopus Server. Ensure that the provided Octopus Server URL addresses can be reached by the AppVeyor servers. If not using the on-premise offering of AppVeyor, this means the Octopus Server must be accessible over the Internet. 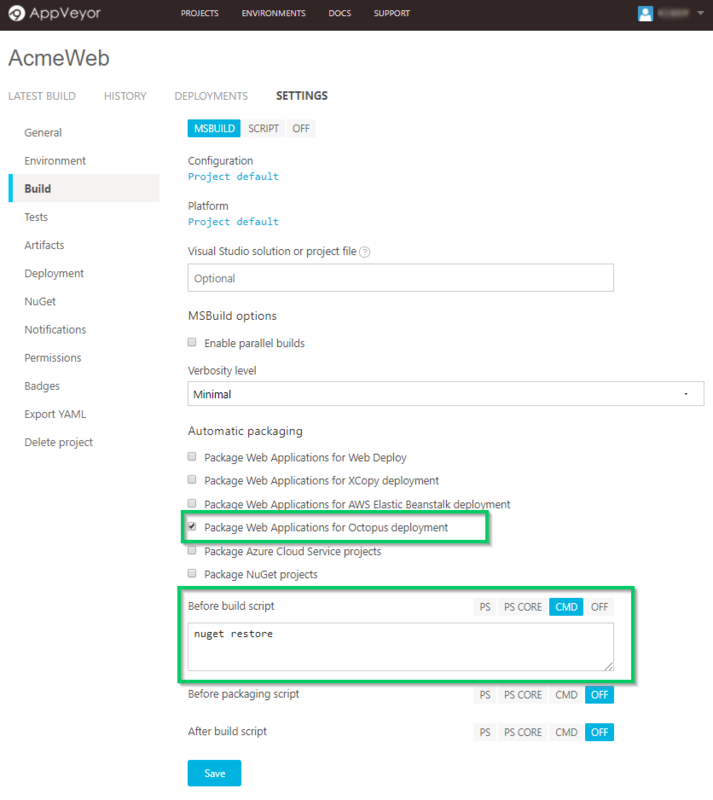 When you define an "Octopus package" in AppVeyor through the Package Web Applications for Octopus Deployment flag or Artifacts page, then AppVeyor will automatically select that package to push to your Octopus Server. Set the Artifact(s) field on the Deployment page if you have manually created an archive. If your Octopus Deploy project doesn't make use of automatic release creation or automatic lifecycle progression you can optionally trigger these actions from within the AppVeyor configuration providing the appropriate values in the inputs provided. Unless overridden, the AppVeyor project name will be used in place of the Octopus project name when creating a release. Storing the configuration with the source code is a great way to version the build process however it is work noting that when AppVeyor detects a appveyor.yml file in the source code, any configuration in the portal will be ignored. Although you can continue to update the configuration via the portal, this will have no effect unless you remove the YAML file or configure the project to explicitly ignore it. For more in-depth information about using AppVeyor, we would recommend checking out their docs.